Does Aerobic Exercise Affect Testosterone? Optimal testosterone levels are key to a good physique. Muscle mass, strength and physical performance are all linked to higher T levels, whereas lower levels coincide with belly fat, poor performance and an increase in the risk of developing long-term illness. One of the common approaches to losing weight and improving body composition is aerobic exercise – going for a run or a swim are ways that many people kick off their fitness plans. Aerobic exercise includes any type of physical activity performed at moderate to high intensity where oxygen is used to generate energy within muscles – the term aerobic literally means ‘with oxygen’. Sometimes referred to as cardiovascular exercise or simply cardio, this type of activity elevates the heart rate, breathing rate and body temperature for prolonged periods of time therefore offers specific physical benefits. Cardio is often continuous, rhythmical and often involves the same cyclical movement pattern over and over – running, swimming, cycling and walking for example. For the most part, working your heart rate up to 70% of its maximum is classed as aerobic; anything above that uses less and less relative oxygen for energy and is therefore classed as anaerobic. Sprinting, weightlifting and power sports are not aerobic as they are too short, intense and don’t rely on oxygen for energy. Common consensus reports that cardio activities reduces long-term health risk by improving a number of physical and metabolic markers of health. To acheive this ‘cardio effect’, the government suggest taking part in aerobic activities 3-5 times per week for a minimum of 20 minutes. Due to the continuous nature and extended period of time in which cardio exercise takes place, it uses oxygen to ‘burn’ fat as fuel. At lower intensities, the body prefers to do this as opposed to using stored carbs, purely because you get more energy. 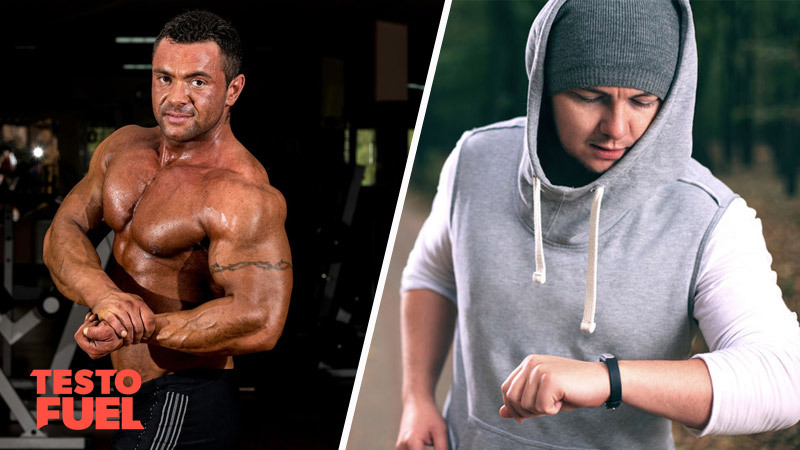 It does however take a very long time for you to burn enough fat to change your body composition just doing cardio, so it is not particularly time-efficient. There has always been a pre-conception that not only is cardio inefficient, it could also blunt testosterone when performed too frequently. It is claimed that excessive cardio can elevate levels of cortisol – the stress hormone that has a negative impact on testosterone. Increased cortisol can lead to a loss of strength, muscle mass, performance and of course T levels. But is that really the case for those wanting to include moderate amounts of cardio in their activity plan? Key Point: Aerobic exercise is a type of physical activity performed at moderate to high intensity where oxygen is used to generate energy within muscles. How Does Aerobic Exercise Affect Your T Levels? Normal T levels for a man lie between 300 and 1000 ng.dL. After the age of 30, testosterone production naturally decreases by around 1% each year leading to a number of potential side effects. Once levels drop below 300, you are clinically classed as hypogonadal or having ‘low T’. A recent study presented by the American Physiological Society  at the 2016 Integrative Biology of Exercise Meeting, suggested that including aerobic exercise in a weekly exercise plan may be key to offsetting the natural decline in testosterone associated with aging. In the study, 44 men were included – two thirds of which were overweight. None of the men were regular exercisers. As you’d expect, the overweight participants had T levels that were much lower than those who were normal weight, as excess fat decreases testosterone. The group took part in a 12-week exercise program involving 40-60 minutes of walking or jogging for 1-3 times per week. It didn’t really matter whether they walked or ran, but exercise was restricted to only mild to moderate intensity. The results showed that the overweight men increased their T levels by 17% – their body weight also significantly decreased too. Interestingly there was no change in T levels in the normal weight group, suggesting that aerobic exercise is a good way of boosting testosterone – but only in overweight exercisers. Not every study shows the same benefits though. As we’ve just seen, cardio doesn’t seem to elevate hormone levels in normal weight men. The same results were also seen in a much larger, 12-month study published in Medicine and science in sports and exercise too . In this long-term study, 102 sedentary men aged 40-70 were either split into 2 groups – those that were asked to participate in moderate to vigorous activity for 1 hour, 6 days per week, or make no change to their daily activity levels. In the exercising group, fitness increased by 10.8% and decreased in the no change group. Importantly though, the exercising group did not show a change in T levels. Whilst it is good that it didn’t decrease, it didn’t boost levels wither. Some studies even show that excessive cardio can decrease testosterone in older males. A study from the University of British Columbia  for example found that older runners who covered more than 40 miles per week had significantly lower T levels compared to those who ran less – this was attributed to much higher cortisol levels. These results were further echoed by another study from Brazil  in which T levels of marathon runners were much lower after completing the full 26 miles in comparison to before. It ultimately seems that if you are overweight, then adding cardio to your physical activity plan is worth doing to boost T levels. If you are normal weight then it makes no real difference unless you are incorporating excessive aerobic activity in your schedule. Key Point: Aerobic exercise may increase testosterone in overweight men but doesn’t seem to affect normal weight men too much. xcessive cardio though may decrease T levels are therefore should be avoided. Aerobic exercise is a type of physical activity where oxygen is used to provide energy. It is usually performed at a moderate to high intensity and involves continuous and rhythmical activities such as walking, running and swimming. 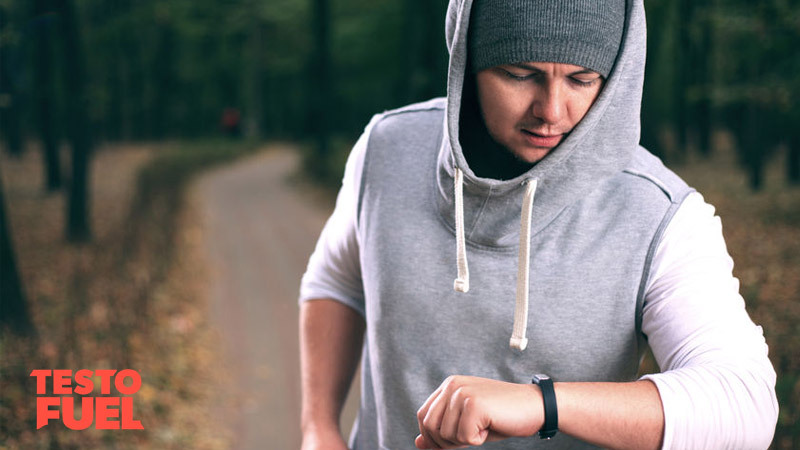 Currently, the government suggest that 20 minutes, 3-5 times per week is enough cardio to improve cardiovascular and metabolic health and decrease the risk of long-term illness. Research suggests that including moderate to high intensity exercise may help to boost testosterone if you are overweight and new to exercise, however it won’t change much if you are at normal weight. Be aware though that excessive amounts may elevate cortisol, the stress hormone that can reduce testosterone.